Once again, as for Parma Ham and Parmigiano Reggiano, it is the territory to make the difference: in fact Culatello di Zibello comes into the world between winter fogs and sultry summers of Parmesan valley. Only in this part of land, wet by River Po, the worthiest part of pork can become Culatello, while in the hills the climate is ideal for the maturing of whole pork thigh and of rind, at Zibello and its surroundings it is the darkness that makes the difference. For this reason, the legend tells that fog is an essential ingredient, as much as salt, pepper, garlic and wine. 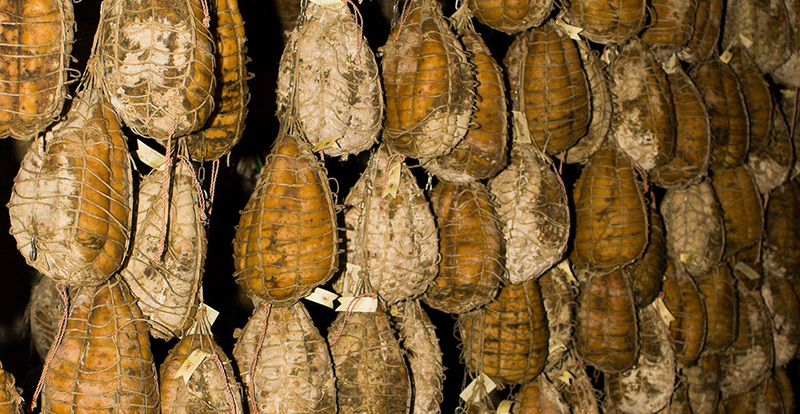 Culatello is obtained from the biggest muscular part of hind limb of pork, without rind of bone. Instead Parma Ham is obtained by inner thigh, Culatello is achieved maturing only the posterior muscle of thigh. In order to obtain a Culatello, you have to “disassemble” a thigh, turning down to address the thigh to a product already refined as Parma Ham. Cut: immediately after the butchery, you can begin cutting the thigh with a knife up to its basis. The kneecap remains attached to the “Fiocchetto”, while femur stays on the part of Culatello. The cleaning of rind and fat: meat is cleaned from fat and rind in order to facilitate its conservation and the penetration of salt. The next phase is concerned with the removal of superfluous femur and fat, in addition to trim off the meat giving it the peculiar pear shape. Salting: in the handcrafted production, salting happens in the period between November and February, in order to take advantage of specific weather conditions in Parmesan valley. After the first 2-3 days of salting, Culatello is massaged and possibly salted again. After a short pause, the product can be washed, dried and covered with an external protection (blister) in order to better preserve and protect it. Binding: it is made with different turns of close nooses, which are from the base to the top. Maturing: maturing corresponds to 12 months. Still nowadays you can take advantage of the underground cellars with a constant temperature of 12-14° and approximately 80/85% of darkness. The weight of the product decreases around 40% during the year. For the production it is used only meat of Italian adult pigs, the same used for the production of Parma Hams protected by Italian Consortium. The quality of raw material, the handcrafted manufacturing and the long maturing are elements which make this product not only one of the best cold cuts of Parma, but one of the absolute excellences of Italian tradition.